The Toronto Marlies moved to within a game of the franchise’s first-ever Calder Cup title after trouncing the Texas Stars 6-2 on Saturday night. Calle Rosen (pictured) led the way with a pair of goals. The Marlies were in complete control from start to finish, getting goals from Andreas Johnsson and Trevor Moore, 47 seconds apart, before the game was three minutes old. 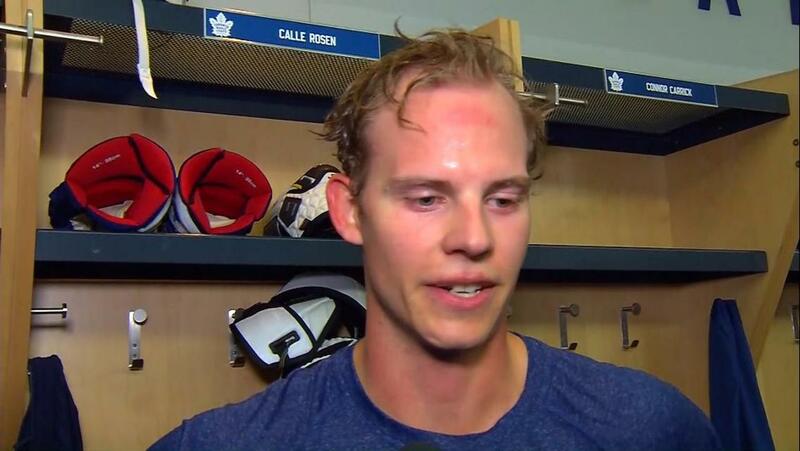 Colin Greening also scored for Toronto. In addition, while the top line of Johnsson, Miro Aaltonen and Carl Grundstrom has struggled in the series, the trio connected on the Marlies’ sixth goal, Grundstrom finishing a two-on-one from Aaltonen to round out the team’s scoring. Garret Sparks made 23 saves in the win. The series now shifts back to Ricoh Coliseum. Game 6 will be played on Tuesday where the Marlies have a chance to win the Calder Cup on home ice.